Merchandising has been centre stage across the industry over the past couple of years but this year it’s really taken off for airlines, travel agencies and Amadeus. Airline deployment of omni-channel merchandising strategies combined with adoption and innovation in the travel agency channel have seen strong results for both sides. Sales of ancillaries through Amadeus rose 85%, generating average incremental revenues of 10-15% per booking for airlines that have implemented Amadeus Ancillary Services. Of the 100 airlines that have signed-up to Amadeus Ancillary Services, more than 60 are actively selling right now. Why the airline enthusiasm? Simple: airlines can deliver a better, more personalised customer experience across all touch-points while at the same time increase their revenues. Amadeus Fare Families, which was only launched in 2014, really gathered momentum this year. Currently, close to 30 airlines have signed-up to Amadeus Fare Families with 20 already using the solution to promote and differentiate their products, services and their brand across all channels. The best part is that the simplified fare display, with distinct sales messages, facilitates up-selling and accelerates buying decisions. Of course, stocked shelves mean nothing if products don’t make it to the check-out counter. We have witnessed a 40% year on year increase in the number of travel agencies, both leisure and corporate, selling ancillary services. But with Online Travel Agencies (OTAs) registering up to 30% attachment rates they are driving most of the growth so far. OTAs have the speed, flexibility and technological savviness to really innovate, test and define winning merchandising techniques for the industry. Add critical mass to the mix, as more and more OTAs jump into the merchandising space, and the potential to boost revenues across the industry is clear. Amadeus is already working with 40 of the world’s top OTA brands, including Expedia, Orbitz, Fareportal and eDreams ODIGEO, to deliver cutting edge capabilities in this area. Merchandising is delivering real results - now! Merchandising is undoubtedly a big opportunity for the industry - airlines, travel agencies and consumers are all starting to enjoy the benefits it offers. This is, however, only just the beginning as more and more travel agencies get on-board. 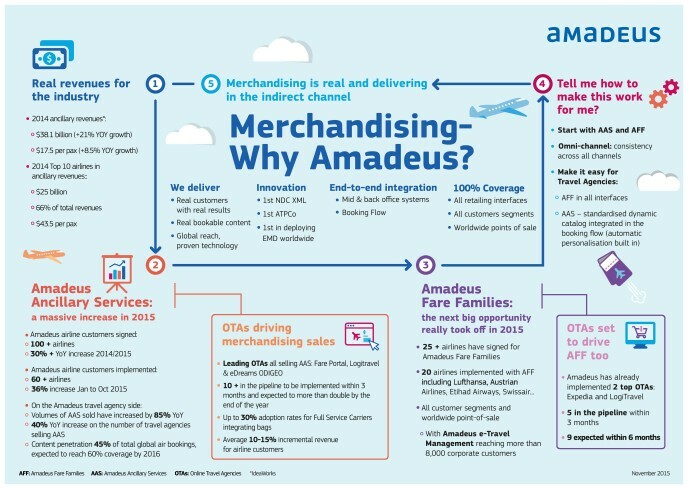 For Amadeus, it’s great to be supporting the industry in making merchandising happen and succeed.